Well, the new fluffy Dredd continues with him spending city money to take care of a sick child. Were she not run over by a truck we would think 2000AD had gone soft. That and Dredd punching the city’s accountant in the face. As we have seen the most credible threats to Dredd don’t come from Perps but from within the system itself. Dredd’s slavish devotion to the law is both his strength and his weakness. The very fact that he could be losing his judgement and not fit to be a judge is a scary prospect. Whilst we may be a little resistant to Dredd exploring or even exhibiting emotions there is an intriguing direction for Dredd opening up if it is handled correctly. Smith delivers the art confidently in what is basically an extended flashback. The disembodied heads can be a little jarring but cram a lot of information in a few short pages. This is definitely an interesting idea. Dredd seeks out his old mentor and trainer Judge Morph when he experiences self-doubt over a recent arrest. The story is well told and the background of the annual Apocalypse Day parade makes this so much more than extended talking heads. The trouble is this behaviour is so uncharacteristic for Dredd it just doesn’t sit right with us. Dredd isn’t supposed to be a normal human being like us. His emotions don’t trouble him and never doubts himself or the law. His function as a character is to allow the writers to comment on our world with Dredd as the absolute constant that anchors the wacky future of the Mega-city. 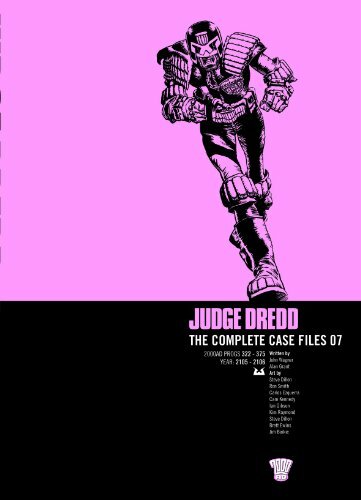 If it were any other Judge this would be a cool story but the notion of Dredd having a soft-centre always makes you uncomfortable. With the Big Meg as your backdrop you can tell any kind of story. Here an urban legend becomes the basis for a Dredd adventure as blind white alligators have infested the pre-Meg sewer system. Throw in a City-Def survival exercise and it is all good. The story shines in the throwaway lines and the little glimpses into the nature of the Megacity. We learn how sewerage works and how it is not just Resyk that doesn’t let anything go to waste. The devil is certainly in the details here. The Kim Raymond art actually finds a niche at last. The almost black panels of the sewers come across much better than Raymond’s earlier efforts and the gator jaws splash page is excellent. How about a trip to the Cursed Earth? 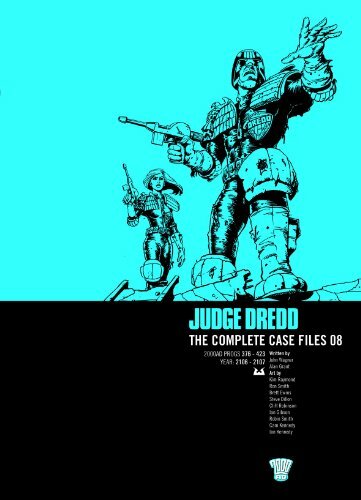 It’s the Dredd story that never fails with outlandish muties and the law relegated to the background. A writer’s free-for-all. Such latitude allows them to utilise one of our favourite characters, Mean Machine Angel. In the tradition of dysfunctional cop/ buddy movies we see Mean and Dredd acting as partners in a way that doesn’t strain credulity. Although this story is typical of the Cursed Earth template, in that it is weirdness and spectacle rather than the usual social mockery, it is a guaranteed enjoyable romp. This tale is firmly in the action/ adventure style that would delight its intended readers and reward the long term fan. What does get annoying is each issue has a story recap, sometimes at the start and sometimes during the action. Ron Smith’s art and his caricatured portraits bring the Cursed Earth and the Angel family to life. I have never seen a more obvious case of filler. Sure, it is well done with lots of MC and sci-fi references but there is nothing that hasn’t been done before. It could have been worse though. There is action, and fire, and explosions, and superbly big-panelled action from the clean-lined Steve Dillon. But that isn’t what makes this story top-notch. These aren’t cartoonish gangsters in pinstripe suits. Here are real people being driven to crime because the conditions they live in are so bad. And all of this can be traced back to the Apocalypse War – the story that keeps on giving. The other reason this story shines is the opening narration is written in the second person. This is extremely rare for all literature let alone for comics. This technique immediately makes it much more personal. You are another step closer to the ordinary citizen. It is always nice to take a look under the rock that is the Big Meg and see stories of people we can empathise with. Of course you get to see just how powerless the Judges actually are at eradicating crime. Like cockroaches that scurry away when the lights are on, as soon as the Judges’ gaze is forced elsewhere, the Perps come back. This is the third story with Rookie Judge Dekker and here we see her graduate. We also see the Sat-Nav was foretold in the pages of 2000AD as each Lawmaster computer functions as one.